Who hasn’t had a fountain soda filled with nugget ice? You can actually feel the weight difference in your cup from regular ice. Many people remove the cover and straw so they can have a drink and ice combo poured into their mouth. It’s soft, chewable, cold and refreshing. Some people like this kind of ice so much they will drive out of their way to get to a fast food restaurant or convenience store that has it. Nugget ice has rapid cooling qualities. Whether you’re using nugget ice for a beverage, injury, display or anything else,, it cools off whatever it comes into contact with quickly. Take for example a sports injury. When you need ice to quickly cool down an injury, a bag filled with nugget ice cools down the injury quickly. Because of its shape it can easily mold to the contour of the injury maximizing the surface area it touches. 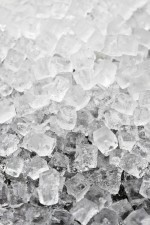 Many rehabilitation facilities have nugget ice machines on their premises, just for this reason. As for beverages, nugget ice virtually cools any liquid instantly once again due to its large surface area and high ice to liquid ratio in any vessel. We can’t explain this phenomenon, but nugget ice is known to retain the flavor of your beverage long after you finish. A crowd favorite as it gives the impression of better value since the flavor and experience last longer than with regular cubes, After downing a super cold drink, you have the benefit of chewing the now flavored ice for an additional experience. When it comes to smoothies and blended cocktails, there is no replacement for using nugget ice. It is perfect on its own and also for blended drinks such as strawberry smoothies or frozen margaritas. First of all, these machines are able to quickly produce ice in a short amount of time and secondly, the ice is soft enough so that it won’t damage the blades of a blender, even with consistent use. The ice quickly breaks down so these types of drinks are made quickly and efficiently. Nugget ice is also used to keep salad bars cool when the bowls of lettuce and other vegetables are placed on top of it. The bowls shape molds right into the bed of ice, which creates the perfect temperature for any food that needs to be kept cool. Vegetables stay crisp for long periods of time when they are properly cooled, so it makes sense that restaurants with salad bars would want to keep a nugget ice machine on site. The next time you’re feeling that craving for a fountain soda, ask yourself why certain locations pop into your mind. We will bet that subconsciously it has something to do with the type of ice. We will always bet on the nugget. Previous Previous post: How Does My Commercial Ice Maker Work?